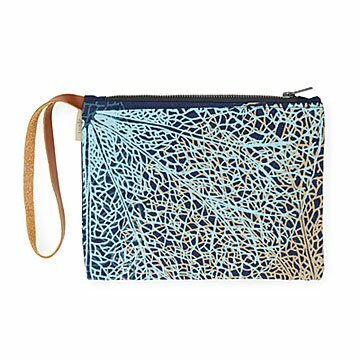 This clutch is created by Cambodian artisans from materials salvaged from mass clothing manufacturers. A lotus lily pad pattern—a symbol of renewal and regeneration—hints at this clutch's reborn materials. Artisans in Cambodia start with scrap materials salvaged from mass clothing manufacturers. Creatively repurposing every last thread of the sturdy cotton canvas and denim, they breathe new life into these remnants, reclaiming would-be waste as stylish and sensible accessories. Hand screen-printed using water-based inks in Cambodia. Vegan leather strap. Learn more about the sustainable story behind this clutch in an interview with the designer on our blog. Hand-wash in cold water, lay flat to dry. Immediately disappointed. I definitely pictured something nicer and a bit smaller.